Two tornadoes ripped into a New Orleans suburb Wednesday afternoon, damaging homes and knocking down power lines, but no injuries were reported, a local government spokeswoman said. The storm hit in Kenner, Louisiana, near the city's international airport. The tornadoes damaged cars and roofs and brought down trees and electrical wires, Jefferson Parish spokeswoman Kriss Fortunato said. Mike Efferson, a meteorologist with the National Weather Service in New Orleans, said the twister had estimated top winds of 90 mph. The second one had winds of 75 mph, the agency said on its Twitter account. Connecticut's powerful offense scored almost at will Tuesday night as the Huskies blew out Louisville 93-60 to win the NCAA women's Division I basketball championship in New Orleans. The title is head coach Geno Auriemma's eighth at UConn, tying him for the most all time with Tennessee's recently retired Pat Summitt. The 33-point margin is the largest in the history of the tournament final. The Mercedes-Benz Superdome stands in semi-darkness shortly after halftime of the Super Bowl on February 3. A combination of technical and communication failures contributed to the partial power outage that disrupted this year's Super Bowl, an independent analysis has determined, utility Entergy New Orleans said Thursday. 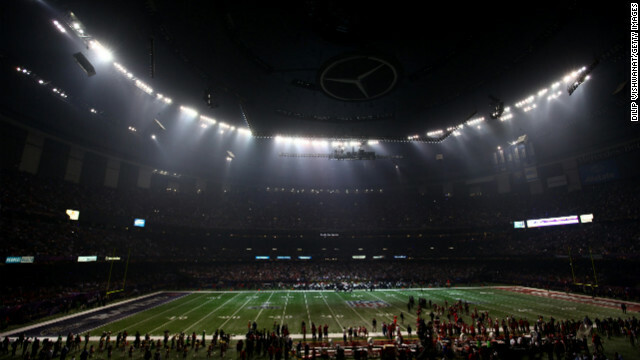 The power was cut off to half the Mercedes-Benz Superdome early in the third quarter of Super Bowl XLVII between the Baltimore Ravens and San Francisco 49ers, causing a 34-minute delay in the February game. Dr. John Palmer of Palmer Engineering & Forensics said a recently installed relay had a "design defect" that caused it to trip in an unpredictable way. He said the device's trip level had been left at the factory default setting, which was inappropriate for its application in the dome. Palmer's report also cited "inadequate communication between the manufacturer and the utility" as a contributing factor. Filed under: Energy • Louisiana • New Orleans • Pro football • Sports • Super Bowl • U.S.
Terrilynn Monette had no problem uprooting her life to help children. When the California native learned of the "teachNOLA" program, which sends educators to New Orleans to teach in impoverished areas, she packed her bags and headed to Louisiana. "I always wanted to be a teacher, and what better place to teach than New Orleans, where passionate teachers are needed most?" Monette said in a 2011 video. Her dedication and excellence in the classroom earned her a "Teacher of the Year" nomination in her district. 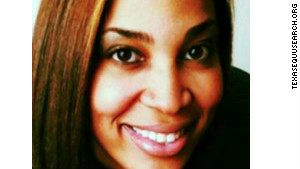 But after a night celebrating the accolade with friends, the 26-year-old vanished. [Updated at 3:41 p.m. ET] We're now getting possibly competing explanations about why the Super Bowl power outage happened Sunday. Hours after the Entergy New Orleans power company announced that it believed a newly installed electrical relay device was to blame, the device's manufacturer responded that the outage happened because the device was operated at an incorrect setting. [Posted at 9:49 a.m. ET] The cause of Sunday's power outage at the Super Bowl in New Orleans has been traced to an electrical relay device, Entergy New Orleans Inc. announced Friday. This device has since been removed from service and new replacement equipment is being evaluated. The 35-minute electrical outage at the Super Dome set off a storm of social media amusement among viewers and inspired advertising tweets with blackout twists. Call it the Super Bowl MVP - the most valuable power outage. For 35 bewildering minutes Sunday night, the Super Bowl showdown between the Baltimore Ravens and the San Francisco 49ers ground to a halt when half of the lights in the New Orleans Superdome went out. Players stretched on the field. The more than 71,000 fans in attendance did the wave. And with no immediate explanation for the outage, social media lit up. Filed under: California • Facebook • Maryland • New Orleans • Technology • Twitter • U.S.
Sean Payton is back with his team after a year's suspension over the team's bounty scandal. 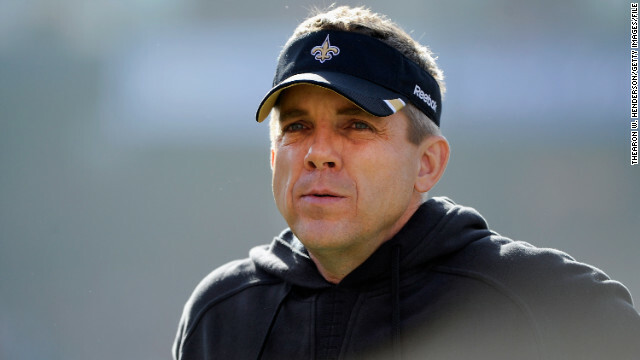 Sean Payton's season of exile from the National Football League is officially over. The NFL on Tuesday reinstated the New Orleans Saints head coach after he served a seasonlong suspension for the Saints' bounty scandal. The reinstatement came after Payton met with NFL Commissioner Roger Goodell and "acknowledged ... his responsibility for the actions of his coaching staff and players," an NFL news release said. Payton said he was "thankful today Commissioner Goodell has granted me reinstatement." "As I stated back in March, I, along with (Saints General Manager) Mickey Loomis, take full responsibility for all aspects of our football program,” Payton said in a statement released by a Saints spokesman. "I clearly recognize that mistakes were made, which led to league violations. Furthermore, I have assured the commissioner a more diligent protocol will be followed." Payton's reinstatement is immediate, meaning he can attend this week's Senior Bowl, a college all-star game featuring NFL Draft prospects. 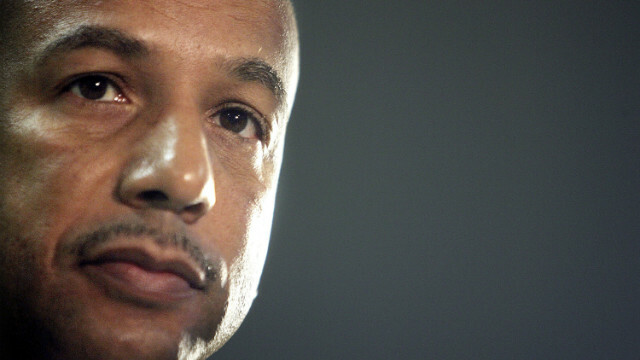 Former New Orleans Mayor Ray Nagin, who captured the drama of Hurricane Katrina in 2005 with an "SOS" call to the nation, was indicted Friday on 21 federal corruption charges, including bribery, money laundering, fraud and filing false tax returns. Nagin (pictured) allegedly defrauded the city through "a bribery and kickback scheme" in which he received checks, cash, wire transfers, personal services and free travel from businessmen seeking contracts and favorable treatment from the city, the 25-page federal indictment says. Soledad O'Brien walks along "the wall." They call it "the wall" - a two-mile long stretch of concrete that's designed to keep the waters of the Gulf from flooding into Lake Borgne then inundating New Orleans neighborhoods like the Lower Ninth Ward, a surge that destroyed homes and left a trail of dead during Hurricane Katrina. This massive post-Katrina effort by the Army Corps of Engineers with three 150-foot-wide gates began in 2009. At 10:30am on Tuesday, the two doors were closed for the first time in anticipation of Hurricane Isaac. 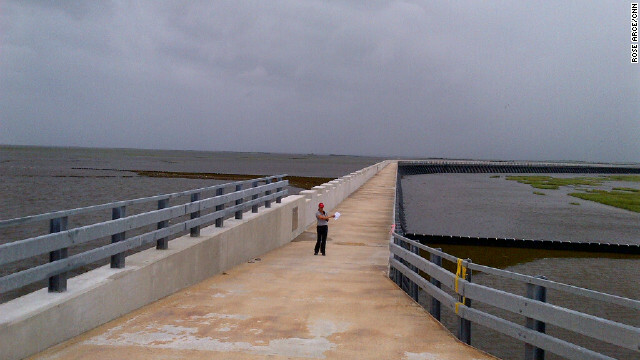 "It will keep water from coming from the Gulf of Mexico through Lake Borgne. Last time the surge went into Lake Borgne and into the heart of the city, " said Col. Edward Fleming of the US Army Corps of Engineers. "This wall is built to 26 feet high and we expect to see surges of eight to 10, maybe 15, feet."